HIV screening. Vascular imaging scans. Genetic risk assessments for Alzheimer's disease. As the number and scope of these direct-to-consumer (DTC) tests proliferate, they're complicating treatment-related decisions for doctors and patients alike. At issue is how best to balance patients' autonomy to stay abreast of their own health without missing out on the guidance that a physician can provide. Added to that mix are the financial aspects involved, ranging from a medical industry eager to reach the consumer directly to high-deductible plans and other insurance trends that can incentivize patients to make an end run around the doctor's office. Meanwhile, a statement last November from FDA Commissioner Scott Gottlieb, MD, indicates that the approval process for genetic health risk screening tests will be streamlined moving forward. That market is sizable, reaching $310 million worldwide by 2022, according to an analysis released earlier this year by market research firm Kalorama Information. Consumers seem poised to buy in. When more than 900 consumers were surveyed six months after getting their own DTC results, 68% supported wider access to such testing and just 14% thought it should be restricted to clinical settings, according to findings published in 2017 in The Milbank Quarterly. Amid this growing market, ACP is particularly concerned about the unnecessary costs and undue anxiety for patients when DTC results lead to follow-up testing to rule out a medical concern, said Wendy Nickel, MPH, Director of ACP's Centers for Quality and Patient Partnership in Healthcare. Direct-to-consumer testing encompasses a wide array of screening, from blood-based tests to imaging scans, with related concerns dependent upon the particular test and who is getting it. ACP hasn't published any guidelines about DTC testing but references genetics testing more broadly in its 2012 Ethics Manual—now in the process of being updated—saying that it shouldn't be pursued until the patient is counseled about risks and benefits. ACP is also finalizing consumer guidance that doctors can share with patients, outlining the potential for false-positives and detailing what the U.S. Preventive Services Task Force (USPSTF) recommends for several commonly marketed tests, such as screening for abdominal aortic aneurysm (AAA) or osteoporosis. The guidance should be available by summer 2018, according to Ms. Nickel. The position statement of the American Association for Clinical Chemistry (AACC), issued in 2015, centers more on cholesterol and other traditional lab work. Along with out-of-pocket costs, since lab work typically isn't covered without a doctor's prescription, AACC leaders also cited the possibility of misinterpretation. “Even when direct access is limited by state law to a narrow menu of general health tests, such as cholesterol and prostate specific antigen (PSA) testing, risk is inherent in the process,” they wrote. But there is the catch-22 for physicians: How can they reach and educate a patient who can bypass them in the first place? Patients are increasingly conducting research online and walking into their appointment asking for a particular test or treatment, said Tom Bledsoe, MD, FACP, who chairs ACP's Ethics, Professionalism and Human Rights Committee. When faced with such requests, Dr. Bledsoe will delve further: What are patients worried about, and what are they hoping to learn with a particular test? 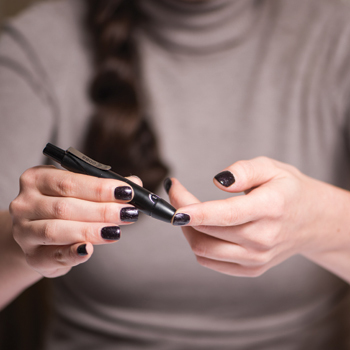 “But that conversation is largely lost in DTC testing,” said Dr. Bledsoe, a clinical associate professor of medicine at Brown University's Warren Alpert Medical School in Providence, R.I. However, it's not necessarily realistic, and to some extent it can be a bit paternalistic, to steer patients away from all DTC testing, said Ann Gronowski, PhD, a clinical chemist and professor of pathology and immunology at Washington University School of Medicine in St. Louis. An HIV test might reach patients who are worried about having contracted the disease and who might otherwise be unwilling or financially unable to see a doctor, she said. Certainly it might be preferable for a patient to get some DTC results, such as an elevated cholesterol reading, rather than to remain in the dark, Dr. Bledsoe noted. “Sure, as long as some interpretation of the results was also available,” he said. But understanding cholesterol readings, he pointed out, has become more complex as their significance is no longer reliant on a few numbers but on other factors as well, such as a patient's age and gender. The consumer guidance that ACP is developing will primarily focus on preventive tests, including imaging scans, which are offered by companies at local health fairs, churches, and other community sites, Ms. Nickel said. For instance, a draft cites the recommendation from the USPSTF on candidates for AAA screening: men ages 65 to 75 years who have ever smoked. Erik Wallace, MD, FACP, said he became interested in these health fair tests when he spent a decade practicing in Oklahoma, through 2013, and noticed how aggressively they were marketed to local residents. He said that a lot of the tests were vascular-related, such as carotid artery ultrasound screening, which is not recommended by the USPSTF for anyone lacking symptoms. Frequently, Dr. Wallace wouldn't hear about these imaging and other tests until patients showed up in his office with the results. “And I would look at their reports and basically come to the conclusion that most if not all of the tests they had gotten done, there was no indication for,” said Dr. Wallace, now an associate professor of medicine at the University of Colorado School of Medicine in Colorado Springs. In one case, he said, a patient was quite concerned about an abnormal thyroid result. But even though she didn't have any symptoms, and the test shouldn't have been ordered in the first place, it took some time to explain why she didn't need any follow-up. In 2012, Dr. Wallace wrote an opinion piece for the Tulsa World, explaining that although these ultrasound screening tests don't require needles or radiation, they aren't as harmless as they might initially appear. In another opinion piece, published the same year in Annals of Internal Medicine, he argued that the marketing of such nonbeneficial tests is unethical. Moreover, it's uncertain whether worrisome results necessarily motivate better health behaviors, Dr. Wallace wrote, citing a 2012 study published in Archives of Internal Medicine that randomized 536 patients who smoked to carotid plaque screening versus no test. Even when the ultrasound identified high rates of plaque, patients were no more likely to quit than those with normal findings or those who didn't get the test. More recently, a 2015 opinion piece in the Journal of General Internal Medicine theorized that high deductibles “may inappropriately accelerate the spread of DTC screening.” For those with such insurance plans, a package of screening tests costing less than $200 or a phone-based mobile app for just a few dollars that “promises to estimate pulmonary function” when the patient blows into the microphone might look increasingly attractive, the authors wrote. The authors suggested that part of the solution involves requiring companies to disclose which DTC tests are already covered by the Affordable Care Act with no out-of-pocket costs. In addition, companies could be required to inform consumers about the risks of screening, as well as professional society recommendations, they wrote. In the meantime, Dr. Bledsoe suggested that doctors take any opportunity to educate their patients about false-positives and other potential pitfalls of some tests. In New England, where he practices, patients will sometimes ask about DTC testing for Lyme disease, he said. While the Lyme disease test is very helpful in someone who might have been exposed, it has a high rate of false-positives for an individual who has no symptoms or tick exposure, he said. But Dr. Bledsoe can only outline those drawbacks if the patient asks about Lyme disease testing in advance. The FDA's recent approval of the first DTC test for genetic health risks opens the door on a new cadre of options and related conundrums. In April 2017, FDA officials approved the marketing of a saliva-based test that screens for genetic variants associated with an elevated risk of 10 diseases or conditions, including late-onset Alzheimer's disease and Parkinson's disease. One concern, as this array of tests expands, is accuracy. An analysis published online March 22 in Genetics in Medicine found that 40% of the genetic variants identified as part of DTC testing in 49 patients proved to be false-positives. Another is that patients will miss out on guidance from a physician or a genetic counselor, said Dr. Bledsoe, who is asked most frequently about genetic testing for Alzheimer's disease. While some argue that more state regulation could limit bypassing of clinicians, consumers could still order these tests online, said Tim Mackey, PhD, an expert on DTC testing and an associate professor at the University of California San Diego School of Medicine. Plus, he said, “there's not much appetite” from a regulatory or a law enforcement standpoint. “You'd be denying people from accessing medical tests which they think might be necessary,” he said. One approach to help patients would be to require disclosure about the pros and cons of DTC testing, as long as it's provided in consumer-friendly language, Dr. Mackey said. Counseling could be required by an outside third party, even if it's via teleconsultation, he said. But neither Dr. Mackey nor Dr. Bledsoe foresee patient interest in DTC testing, genetic or otherwise, waning any time soon given the time and cost involved in getting into a physician's office. LeFevre ML; U.S. Preventive Services Task Force. Screening for abdominal aortic aneurysm: U.S. Preventive Services Task Force recommendation statement. Ann Intern Med. 2014;161:281-90. Wallace EA, Schumann JH, Weinberger SE. Ethics of commercial screening tests. Ann Intern Med. 2012;157:747-8.